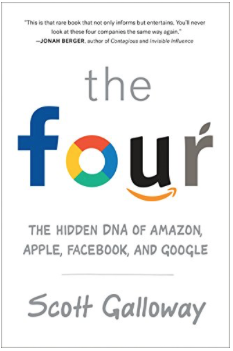 Scott Galloway‘s The Four: The Hidden DNA of Amazon, Apple, Facebook, and Google is an instant classic. Instead of buying the myths these compa­nies broadcast, Galloway asks fundamental questions. How did the Four infiltrate our lives so completely that they’re almost impossible to avoid (or boycott)? Why does the stock market forgive them for sins that would destroy other firms? And as they race to become the world’s first trillion-dollar company, can anyone chal­lenge them? I tell my students the goal of the course I teach is to provide them with an edge so they can build economic security for themselves and their families. I wrote this book for the same reason. I hope the reader gains insight and a competitive edge in an economy where it’s never been easier to be a billionaire, but it’s never been harder to be a millionaire. The Four – Apple, Amazon, Facebook, and Google – have created hundreds of thousands of high-paying jobs, and are responsible for an array of products and services that are entwined into the daily lives of billions of people. How do we better understand these firms, the instincts they tap into, and their intersection between technology and stakeholder value is to gain insight into modern-day business, our world, and ourselves? Yes, the Four have generated unprecedented wealth ($2.3 trillion) that, via stock ownership, has helped millions of families across the planet build economic security. But I ask readers and students to consider another view, one that’s more troublesome. What is it about the four companies – Amazon, Apple, Facebook and Google – that worries you? One, a retailer that refuses to pay sales tax, treats its employees poorly, destroys hundreds of thousands of jobs, and yet is celebrated as a paragon of business innovation. Two, a computer company that withholds information about a domestic act of terrorism from federal investigators, with the support of a fan base that views the firm similar to a religion. Three, a social media firm that analyzes thousands of images of your children, activates your phone as a listening device, and sells this information to Fortune 500 companies. And four, an ad platform that commands, in some markets, a 90 percent share of the most lucrative sector in media, yet avoids anticompetitive regulation through aggressive litigation and lobbyists. What happened to “don’t be evil”? That mantra was a wish, or rather a prayer. We know these companies aren’t benevolent beings, yet we invite them into the most intimate areas of our lives. We willingly divulge personal updates, knowing they’ll be used for profit. Our media elevate the executives running these companies to hero status- geniuses to be trusted and emulated. Our governments grant them special treatment regarding antitrust regulation, taxes, even labor laws. And investors bid their stocks up, providing near-infinite capital and firepower to attract the most talented people on the planet or crush adversaries. How did these companies aggregate so much power? How can an inanimate, for-profit enterprise become so deeply ingrained in our psyche that it reshapes the rules of what a company can do and be? What does unprecedented scale and influence mean for the future of business and the global economy? Are they destined, like other business titans before them, to be eclipsed by younger, sexier rivals? Or have they become so entrenched that nobody- individual, enterprise, government, or otherwise- stands a chance? So you sound the alarm on unchecked power demonstrated by these four companies? Ultimately, the only competitors the Four face are each other. But what’s wrong with Amazon simply doing a better job at satisfying the customer? Amazon has become the Prince of Darkness for retail, occupying a unique position- inversely correlated to the rest of the sector. Traditionally, stocks in the same sector trade sympathetically – in lockstep with one another. Not anymore. The equity markets now believe that what’s good for Amazon is bad for retail, and vice versa. It’s a situation almost unique in business history. And it has become a self-fulfilling prophecy, as Amazon’s cost of capital declines while every other retailer’s increases. It doesn’t matter what the reality is – Amazon will win, as it’s playing poker with ten times the chips. Amazon can muscle everyone else out of the game. The real hand-wringing is going to begin when people start asking if what’s good for Amazon is bad for society. It’s interesting to note that even while some scientists and tech tycoons (Stephen Hawking, Elon Musk) publicly worry about the dangers of artificial intelligence, and others (Pierre Omidyar, Reid Hoffman) have funded research on the subject, Jeff Bezos is implementing robotics as fast as he can at Amazon. Let’s look at one of the four. What has Amazon done differently to achieve this unprecedented power? Amazon ‘s core competence is storytelling. Through storytelling, outlining a huge vision, Amazon has reshaped the relationship between company and shareholder. The story is told via media outlets, especially those covering business and tech. Many of them have decided tech CEOs are the new celebrities, and they give Amazon the spotlight, center stage, and star billing anytime. Until now, the contract companies have with shareholders is: give us a few years and tens of millions of dollars, and then we’ll begin returning capital to you in the form of profits. Amazon blew up this tradition. Profits have been replaced with vision and growth – via storytelling. Amazon has had more access to cheaper capital for a longer period than any firm in modern times. Most successful VC-backed tech companies in the nineties raised less than $50 million before showing a return to investors. By comparison, Amazon raised $ 2.1 billion in investors’ money before the company (sort of) broke even. Amazon can launch a phone, invest tens, maybe hundreds, of millions of dollars on development and marketing, have it fail within the first thirty days, and then treat the whole disaster as a speed bump. If any other Fortune 500 company – be it HP, Unilever, or Microsoft – launched a phone that proved DOA, their stock would be off 20 percent plus, as Amazon’s stock was in 2014. But as shareholders screamed, the CEOs of those other companies would blink and order a company-wide retreat and pull in its horns. Not Amazon. Why? Because if you have enough chips and can play until sunrise, you’ll eventually get blackjack. Amazon has trained the Street to hold them to a different standard. The company’s revolutionary timeline of capital allocation is what we’ve been preaching about in business school – disregard the short-term and focus on long-term goals. In your book you describe the difference between “normal” business thinking and “Amazon business thinking.” Can you tell our readers what you mean? No. There is a rebel force of innovative retailers out there who are fighting the Empire. Sephora, Home Depot, Best Buy. They are investing in people and technology. Consumers don’t go to the store for products anymore. They go for advice. Which strategy will emerge victorious? The answer will decide the fate of not just companies, but millions of workers and households as well. We need business leaders who envision and enact a future with more jobs, not billionaires who want the government to fund, with taxes they avoid, social programs for people to sit on their couches and watch Netflix all day. Show some f*cking vision, Jeff! Thanks, Professor Galloway. And thank you for writing this insightful book – which is an instant classic, in my view.